The Federal Clean Air Act requires the United States Environmental Protection Agency (USEPA) to set National Ambient Air Quality Standards (NAAQS) for six common air pollutants. These commonly found air pollutants also known as "criteria pollutants" are particle pollution or particulate matter (PM), ground-level ozone, carbon monoxide (CO), sulfur dioxide (SO2), nitrogen dioxide (NO2), and lead. These pollutants can harm your health, the environment, and cause property damage. The USEPA calls these pollutants "criteria" air pollutants because it regulates them by developing human health-based and/or environmentally-based criteria (science-based guidelines) for setting permissible levels. Limits based on human health are called primary standards. The USEPA also can establish a second set of limits intended to prevent environmental and property damage, which are referred to as secondary standards. The Federal Clean Air Act further requires the USEPA to review and, if appropriate, revise the NAAQS for each criteria air pollutant every five years to ensure they continue to adequately protect human health and welfare. For more information on the criteria pollutants, see the USEPA's NAAQS website at https://www.epa.gov/criteria-air-pollutants/naaqs-table. When a NAAQS is established or revised, the USEPA goes through a formal process to designate all areas of the country as either in attainment or in nonattainment. Based on the Federal Clean Air Act, the USEPA further classifies ozone, carbon monoxide, and particulate matter nonattainment areas based on the magnitude of an area's air pollution. Nonattainment classifications may be used to specify what air pollution reduction measures an area must adopt, and when the area must reach attainment. The technical details underlying these classifications are discussed in the Code of Federal Regulations, Part 81 (40 CFR 81). Certain areas designated as nonattainment for a criteria pollutant (such as areas classified as moderate and above for ozone) must develop plans that show how they will bring those areas into attainment of the standard by their designated attainment dates. Once an area meets its attainment date, it can be re-designated to attainment by submitting maintenance plans for these areas to the USEPA to ensure continued attainment of the area over two consecutive 10 year periods. These re-designated areas are referred to as “maintenance areas.” The USEPA Green Book provides detailed information about area NAAQS designations, classifications and nonattainment status at the following website: https://www.epa.gov/green-book. In 1979, the USEPA established a 1-hour ozone standard of 0.12 parts per million (ppm). Under the 1-hour ozone standard, the entire State of New Jersey was designated as nonattainment. There were three multi-state nonattainment areas and a New Jersey-only nonattainment area for the 1-hour NAAQS. The first multi-state area was the Philadelphia-Wilmington-Trenton nonattainment area, which consisted of Burlington, Camden, Cumberland, Gloucester, Mercer, and Salem Counties in New Jersey. The second multi-state area was the New York-Northern New Jersey-Long Island nonattainment area, which consisted of Bergen, Essex, Hudson, Hunterdon, Middlesex, Morris, Monmouth, Ocean, Passaic, Somerset, Sussex, and Union Counties in New Jersey. The third multi-state area was the Allentown-Bethlehem-Easton nonattainment area, which consisted of Warren County in New Jersey. The New Jersey-only nonattainment area was the Atlantic City nonattainment area, which consisted of Atlantic and Cape May Counties. On June 15, 2005, the 1-hour ozone standard was revoked for all areas except the 8-hour ozone nonattainment Early Action Compact Areas (EAC) in accordance with 40 CFR 50.9(b). New Jersey did not have any EAC areas, or areas that had deferred effective dates for their designations under the 8-hour ozone standard. Due to the revocation of the 1-hour ozone standard, effective June 15, 2005, Federal Register 70 FR 44470 removed from 40 CFR part 81 the 1-hour designations and classifications for all areas (except EAC areas.) The former 1-hour ozone designations and classifications as of June 15, 2004, were retained in subpart C of Part 81 for purposes of the anti-backsliding provisions of 40 CFR 51.905. 40 CFR 51.905(c) references subpart C of part 81 for the areas affected by the anti-backsliding regulation. The anti-backsliding provision is in place to prevent areas from undoing any air quality improvement measures or to make sure areas keep their commitments to improving air quality as committed to in their federally approved state implementation plans (SIPs). For a map of the nonattainment areas in New Jersey for the revoked 1-hour standard, click here. For more information on the 1-hour ozone NAAQS and designations, see USEPS's website at https://www.epa.gov/criteria-air-pollutants/naaqs-table and https://www.epa.gov/green-book. In 1997, the USEPA established an 8-hour ozone standard of 0.08 parts per million (ppm). The USEPA finalized attainment/nonattainment designations for the 1997 8-hour ozone NAAQS on June 15, 2004. The entire state of New Jersey was designated into two multi-state nonattainment areas, the New York-Northern New Jersey-Long Island (NJ-NY-CT) nonattainment area and the Philadelphia-Wilmington-Atlantic City (NJ-PA-DE-MD) nonattainment area. The 1997 8-hour ozone NY-NJ-CT nonattainment area includes the New Jersey counties of: Bergen, Essex, Hudson, Hunterdon, Middlesex, Monmouth, Morris, Passaic, Somerset, Sussex, Union, and Warren. The 1997 8-hour ozone PA-NJ-DE-MD nonattainment area includes the New Jersey counties of: Atlantic, Burlington, Camden, Cape May, Cumberland, Gloucester, Mercer, Ocean, and Salem. On March 12, 2008, the USEPA revised the 8-hour ozone NAAQS. The primary 8-hour ozone standard was lowered from 0.08 ppm to 0.075 ppm. The secondary standard was also lowered to make it equal to the primary standard. On April 1, 2009, New Jersey submitted recommendations for designating nonattainment areas for the 2008 revised ozone standard to the USEPA. The USEPA announced on September 16, 2009 that the 0.075 ppm standard was being reconsidered, and the designations were stayed (put on hold). For more details on New Jersey ’s submission to the USEPA, click here. On January 6, 2010, the USEPA proposed to strengthen the 8-hour ozone NAAQS set in March 2008 to a level within the range of 0.060-0.070 ppm. The USEPA also proposed establishment of a distinct cumulative, seasonal “secondary” standard, designed to protect sensitive vegetation and ecosystems, including forests, parks, wildlife refuges and wilderness areas within the range of 7-15 ppm-hours. In September of 2011, the USEPA announced it would not adopt its proposed ozone NAAQS and that it would instead proceed with implementation of the 2008 0.075 ppm 8-hour standard. On May 21, 2012, the USEPA designated the entire state of New Jersey as nonattainment for the 0.075 ppm 8-hour ozone NAAQS. The nonattainment areas are the same as those designated for the 0.08 ppm standard. For a map of the existing nonattainment areas in New Jersey for the 8-hour standard, click here. For a table of the above counties/municipalities designated as nonattainment for both ozone standards, click here. On October 26, 2015, the USEPA again revised the 8-hour ozone NAAQS. The primary and secondary 8-hour ozone standards were lowered from 0.075 ppm to 0.07 ppm. On September 29, 2016, New Jersey submitted recommendations for designating nonattainment areas for the 2015 ozone standard to the USEPA. For more details on New Jersey ’s submission to the USEPA, click here. Designations are currently pending. For more information on the 8-hour ozone NAAQS and designations, see USEPA's websites at https://www.epa.gov/criteria-air-pollutants/naaqs-table and https://www.epa.gov/green-book. In 1997, the USEPA established annual and 24-hour NAAQS for PM2.5 for the first time. The NAAQS were set at 15 µg/m3 for the annual standard and 65 µg/m3 for the 24-hour standard. Thirteen of New Jersey ’s 21 counties were designated as nonattainment for the 1997 annual standards, and were associated with two multi-state nonattainment areas, the Northern New Jersey/New York/ Connecticut (NNJ-NY-CT) nonattainment area and the Southern New Jersey/Philadelphia (SNJ-PA-DE) nonattainment area. New Jersey counties that were in the NNJ-NY-CT nonattainment area are Passaic, Bergen, Morris, Essex, Hudson, Union, Somerset, Middlesex, Monmouth, and Mercer Counties. New Jersey counties that were in the SNJ-PA-DE nonattainment area are Burlington, Camden, and Gloucester Counties. 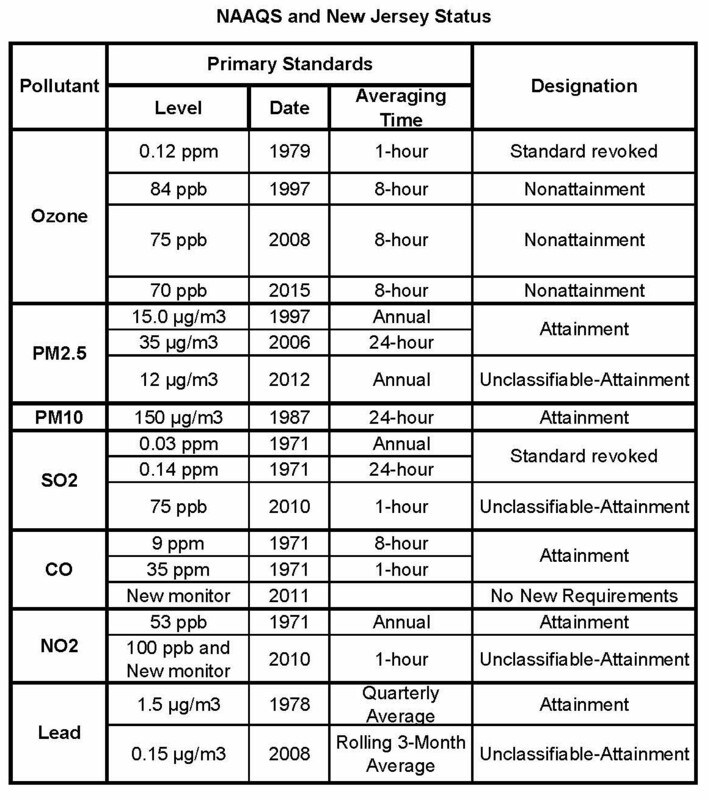 In 2006, the USEPA revised the 24-hour NAAQS for PM2.5 from 65 µg/m3 to 35 µg/m3. The State submitted its recommendation of nonattainment areas in New Jersey to the USEPA on December 18, 2007. On August 19, 2008, the USEPA responded to state designation recommendations and proposed designations for areas for the 35 µg/m3 24-hour PM2.5 NAAQS. On December 22, 2008, the USEPA signed a notice on the final designations but it was not published in the Federal Register due to the change in Federal Administration which required that all rules not yet finalized would undergo review before being released. On October 8, 2009, the designations were finalized and published in the Federal Register on November 13, 2009. The New Jersey nonattainment areas for the 24-hour 35 ug/m3 standard were the same as for the annual 15 ug/m3 standard. In December of 2012, New Jersey submitted a request for re-designation to attainment of the annual 15 ug/m3 and 24-hour 35 ug/m3 standards to the USEPA.On August 13, 2013, the USEPA re-designated New Jersey’s 13 nonattainment counties to attainment for the annual 15 ug/m3 and the 24-hour 35 ug/m3 PM2.5 NAAQS, effective September 4, 2013. On December 14, 2012, the USEPA revised the annual NAAQS for PM2.5 from 15 µg/m3 to 12 µg/m3. 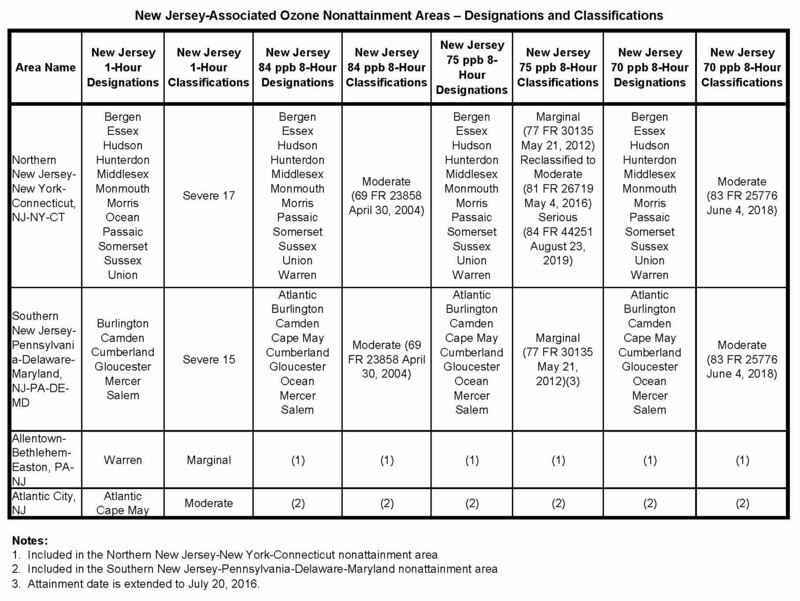 On January 15, 2015, USEPA designated New Jersey as unclassifiable/attainment for the 2012 annual 12 ug/m3 PM2.5 NAAQS. For more information on the PM2.5 NAAQS and designations, see USEPA’s websites at https://www.epa.gov/criteria-air-pollutants/naaqs-table, https://www.epa.gov/particle-pollution-designations and https://www.epa.gov/green-book. In 1971, the USEPA established the NAAQS for SO2 as 0.14 parts per million (ppm) for the 24-hour primary standard, 0.03 ppm for the annual primary standard, 0.5 ppm for the 3-hour secondary standard and 0.02 ppm for the annual secondary standard. Portions of Warren county New Jersey were designated nonattainment. In 1973, the secondary 3-hour SO2 standard was retained, without revision and the secondary annual SO2 standard revoked. In 1996, the existing primary SO2 standards were retained, without revision. On June 22, 2010, the USEPA established a new 1-hour SO2 standard at 75 parts per billion (ppb). The primary annual and 24-hour SO2 standards were revoked. On June 23, 2011, New Jersey recommended the entire state be designated unclassifiable for the 1-hour sulfur dioxide NAAQS, except for the areas identified in New Jersey’s Section 126 petition to the USEPA in Warren county as being impacted by the emissions from the Portland Power Plant located in Pennsylvania. On April 3, 2012, the existing secondary SO2 standard (3-hour average) was retained, without revision. As of June 1, 2014, the Portland coal-fired units in New Jersey’s 126 petition were shut down. Since then, the local air quality monitor in Warren County measured sulfur dioxide levels significantly below the 75 ppb 1-hour sulfur dioxide NAAQS. On December 20, 2017, the USEPA designated the entire state of New Jersey as unclassifiable/attainment for the 2010 1-hour standard for SO2. For more information on SO2 NAAQS and designations, see USEPA’s websites at https://www.epa.gov/criteria-air-pollutants/naaqs-table and https://www.epa.gov/green-book. In 1971, the USEPA established the NAAQS for CO as 35 parts per million (ppm) for a 1-hour average and 9 ppm for an 8-hour nonoverlapping average. An area meets the CO NAAQS if no more than one 8-hour value per year exceeds the threshold. (High values that occur within 8 hours of the first one are exempted. This is known as using "nonoverlapping averages.") To be in attainment, an area must meet the NAAQS for two consecutive years and carry out air quality monitoring during the entire time. New Jersey had eleven nonattainment areas in three areas of the State for the 8-hour carbon monoxide NAAQS as follows: 1) Camden County – All of Camden County; 2) Nine Not-Classified Areas - the City of Atlantic City (in Atlantic County), the City of Burlington (in Burlington County), the Borough of Freehold (in Monmouth County), the Town of Morristown (in Morris County), the Borough of Penns Grove (in Salem County), the City of Perth Amboy (in Middlesex County), the Borough of Somerville (in Somerset County), the Toms River Area (in Ocean County), and the City of Trenton (in Mercer County); and 3) Northeastern New Jersey - Hudson, Essex, Bergen and Union Counties, and the municipalities of Clifton, Passaic and Paterson in Passaic County (part of the New York City/Northern New Jersey/Long Island carbon monoxide maintenance area). In 1996 and 2002 all of New Jersey’s nonattainment areas were re-designated to attainment maintenance areas. On August 12, 2011, USEPA issued a decision to retain the existing NAAQS for CO, however, added new requirements for CO monitoring by requiring CO monitors to be sited near roads in certain urban areas. In June of 2015, New Jersey submitted its second and final CO NAAQS maintenance plan for the 1971 standards. In 1971, the USEPA established the NAAQS for nitrogen dioxide (NO2) as an annual (arithmetic mean) standard set at 0.053 parts per million (ppm) (100 µg/m3). New Jersey was in attainment of the standard. On June 26, 2009, the USEPA proposed revised NO2 standards. On January 22, 2010, the USEPA established a new 1-hour NO2 standard at 100 parts per billion (ppb) and retained the current annual average NO2 standard of 53 ppb. To determine compliance with the new standard, the USEPA established new ambient air monitoring and reporting requirements for NO2 by requiring NO2 monitors to be sited near roads in certain urban areas. On February 11, 2011, New Jersey submitted its recommendations for NO2 designations to the USEPA (http://www.state.nj.us/dep/baqp/NO2.pdf). On February 12, 2012, New Jersey was designated by the USEPA as unclassifiable/attainment for the 1-hour NO2 standard. For more information on NO2 NAAQS and designations see USEPA’s websites at https://www.epa.gov/criteria-air-pollutants/naaqs-table and https://www.epa.gov/green-book. In 1978, the USEPA established a lead NAAQS as a quarterly average standard set at 1.5 µg/m3. The State was designated as attainment for the 1.5 µg/m3 lead standard. On October 15, 2008, the USEPA revised the lead NAAQS and established it as a rolling 3-month average (maximum) not to exceed 0.15 µg/m3 over a 3-year period. On October 15, 2009, New Jersey submitted its recommendations for lead designations to the USEPA. On December 14, 2010, the USEPA lowered the lead emissions monitoring threshold from 1.0 tons per year (tpy) to 0.50 tpy (except for airports) and required lead monitoring at NCore Network sites instead of the current requirement to place lead monitors in each Core Based Statistical Area with a population of 500,000 or more people. On November 22, 2011, New Jersey was designated by the USEPA as unclassifiable/attainment for the 0.15 ug/m3 standard. On October 18, 2016, the USEPA retained the existing NAAQS without revision. For more information on the lead NAAQS and designations see USEPA’s websites at https://www.epa.gov/criteria-air-pollutants/naaqs-table and https://www.epa.gov/green-book.